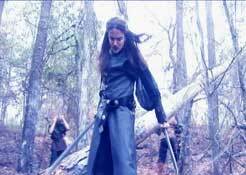 Live Action Role Playing, or LARPING, is an activity for all ages. And no piece of equipment is more important that the weapons you carry, spells you wield and clothing you wear. We invite you to bring the adventure home with the entire Warlords line by Windlass! Our tabards are of machine washable heavy duty cotton and our accessories like belts and frogs are genuine leather. So have fun and generally look awesome! Great product. I'm very satisfied with this tunic. Looks and fits great, thank you!